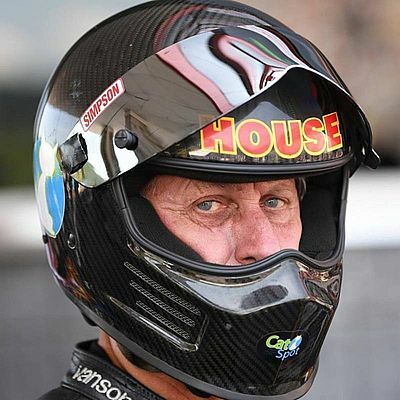 HOUSTON (Feb. 5) -- Rickey House has been a multi-time national event winner and solid title contender in the two years since the Mickey Thompson Tires Top Fuel Harley Drag Racing Series has competed on the NHRA stage. This season he wants to add "world champion" to his list of accomplishments. Matched up against the best in the sport, House has bravely fought against his adversaries, and with the continued support of Tommy Thompson -- this year through the Magic Dry Organic Absorbent brand -- he shows no signs of slowing down. And even though he's a small operation out of his own motorcycle repair shop in Humble, Texas, he routinely shows the ability to run with the top bikes. "We stopped by Phoenix to test on the way out here to Pomona," House said. "I really just wanted to make sure we'd put the bike together properly and that the engine was ready. I told myself if we ran a 6.35 or quicker I wouldn't make but one pass. Right out of the trailer we ran a 6.338 at 221 mph, and we stumbled a bit during that one, so I loaded it back up and headed out. "I just decided not to push my luck. That motor has to make it seven more runs so I don't want to wear it out yet. I'm pretty satisfied with what we did. We were going to run that motor once and then change it out and test the other one but I decided not to after it tried to drizzle a couple of times. I didn't want to get everything switched out and then watch it rain." Since he assembled both of his powerplants exactly the same way, House feels confident he'll be ready to go this weekend in Pomona and two weeks later when the NHRA tour returns to Wild Horse Pass Motorsports Park for the 35th annual Magic Dry Organic Absorbent NHRA Arizona Nationals. "That'll be a huge race because Magic Dry is the title sponsor," House said. "We want to win them all but winning that one would be extra special. Hopefully the weather will be a little bit different. I don't care for the rain and high winds we had last weekend. "I always run pretty well in Phoenix but for some reason I go to Pomona and struggle. I got lucky and made it to the finals in Pomona last year but I feel like I've got to change something up to repeat that this weekend. I'll be working on a tune-up this week. We'll look at the track prep and the weather and go from there. "We only race 10 times so every event is big. If we want to be champions, we need to be ready every time."